Many patients request lip injections, as they love fuller, plump lips. Juvederm, and other fillers can be injected into the lips, cheeks, smile lines and many other areas to immediately diminish the appearance of lines and wrinkles as well as and volume without the downtime that surgery requires. They can provide significant enhancement for many patients, especially when combined with other skin rejuvenation treatments. Because there are many different types of dermal fillers, the experienced staff at Chic la Vie™ will help you determine which filler will best fit your unique needs. JUVÉDERM® ULTRA and JUVEDERM® ULTRA PLUS, is a smooth gel dermal filler that diminishes the appearance of smile lines and vertical lip lines as well as restores natural contours. Each lidocaine-infused injection provides smooth, natural-looking results around the nose and mouth that last up to one year. 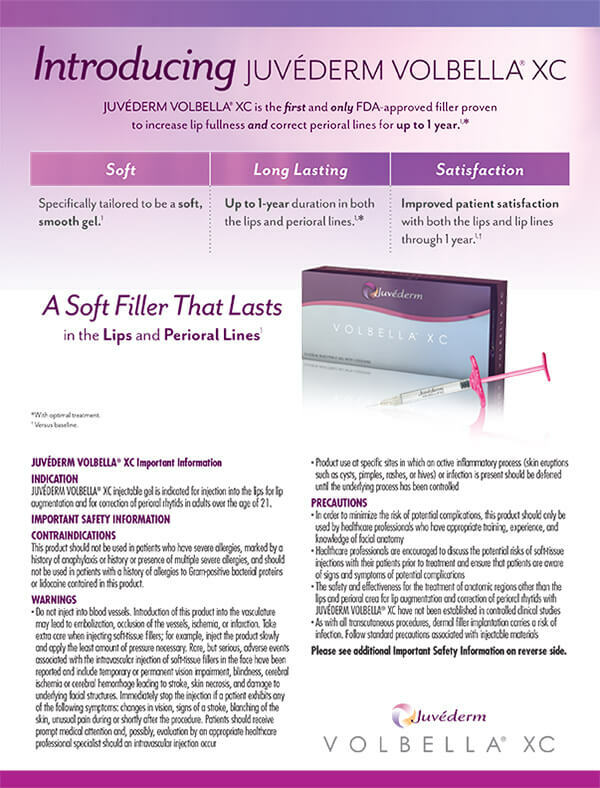 JUVEDERM® VOLUMA is the first FDA hyaluronic filler approved to temporarily correct volume loss in the cheek area. Juvederm® Voluma restores your natural looking youthful appearance and lasting results up to two years. 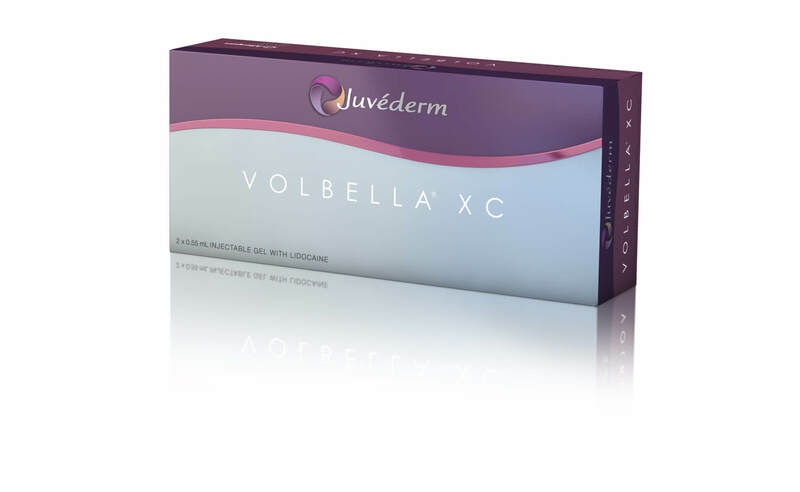 Juvederm® Voluma is also used to fill other facial volume loss and folds. RADIESSE® is a calcium based volumizing dermal filler that instantly restores volume to the face and reversing moderate to severe wrinkles, lines, and folds and stimulating collagen production. Acting as a scaffold under the skin to provide lift, Radiesse is most effective at diminishing smile lines, marionette lines, pre-jowl lines and chin wrinkles. Results of Radiesse injections have lasted more than one year in many patients. BELOTERO BALANCE® is an injectable dermal filler that reduces the appearance of moderate to severe facial wrinkles and folds instantly. Belotero instantly adds volume and creates soft even correction for smile lines, corners of the mouth, marionette lines, and vertical lip lines. For many patients, the results of Belotero last 6 months or longer. Restylane® is a dermal filler that is used to create fullness in facial areas that lack volume. It is most effective for moderate to severe wrinkles, folds, and lines between the nose and corners of the mouth as well as adding volume to lips and cheeks. Many patients have enjoyed the results of Restylane® for 6-9 months, including use as lip injections. Patients may experience some redness and bruising from the deep injection of Restylane® . Ask about our competitively priced packages on filler treatments. I love this spa! I've had tons of facials and treatments from them and they are amazing and welcoming every time. My skin looks amazing thanks to them! I go to Liz a lot, and the ladies at the front desk are lovely! I've had several treatments done from facials to Lip injections and couldn't be happier! All the girls are so friendly and informative especially Andrea love her! Kim at the front desk is always friendly and such a ray of sunshine. She is very informative and she always remembers me! I have had multiple services done by all of the girls and I am a happy customer. I highly recommend Chic La Vie! Amber was extremely professional and explained every detail to me clearly. I absolutely LOVE chiclavie! I highly recommend coming here, you won't be disappointed.